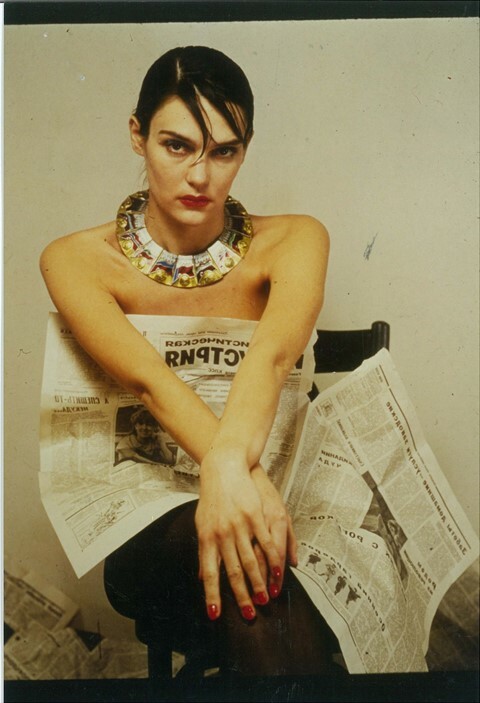 Soviet nostalgia took many forms for the Russian fashion icon, painter and fashion designer Elena Khudiakova, who passed away earlier this year aged 57. Described as “exquisitely beautiful and enchanting company,” by her friend Francis Bacon, Khudiakova’s work was collected by everyone from Charles Saatchi to Elton John, and her paintings are now on display at a new exhibition at Mayfair gallery, Dadiani Fine Art. 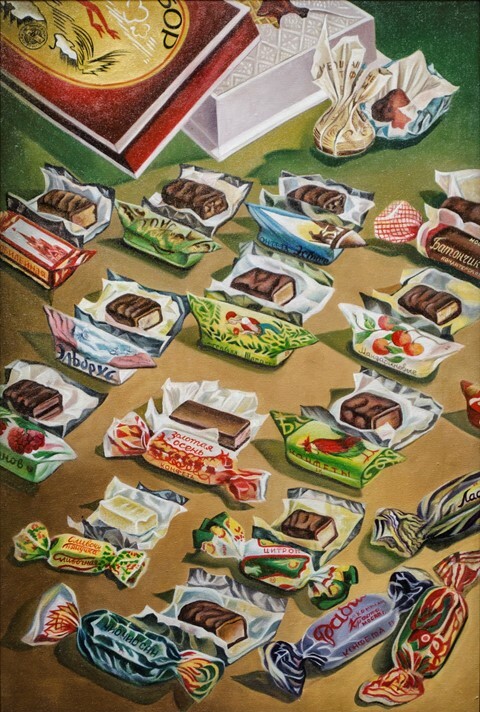 Khudiakova’s vivid Soviet pop art wryly presented the symbols and spoils of the Communist state, from tins of caviar spilling over to piles of children’s sweets. Equally brilliant, her fashion designs reworked 1920s Soviet military imagery: ballgowns were covered in planes, ships and tractors showcasing Soviet might; traditional overalls were fitted with badges of Soviet building; billowing skirts were brandished with images of stern Soviet workers' faces. The Kremlin skyline became an elegant raised neckline – and naturally, her collections were coloured a deep red. “It’s like a Russian march,” a glamorous young Khudiakova explained in heavily accented English to a “This Morning” ITV presenter in the late 1980s. 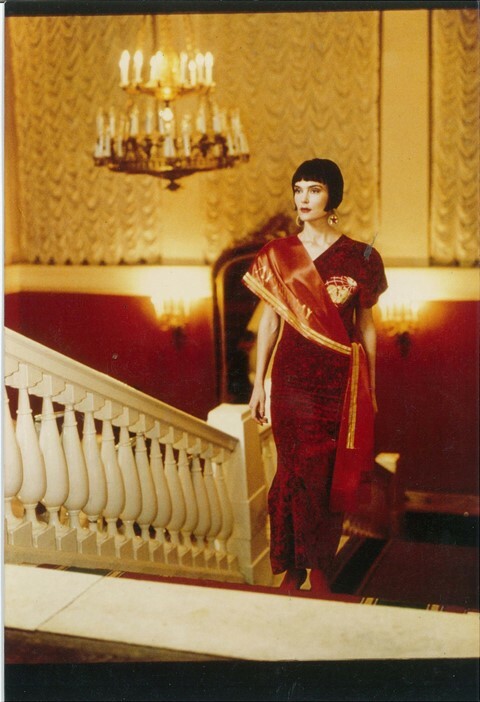 Khudiakova’s designs were perhaps more tongue-in-cheek than state-sanctioned, so it was no surprise that she left Moscow for London in 1989 as a young woman, one of the first Russians to leave under invitation, only venturing back to Russia infrequently after the collapse of the USSR in 1991. Birch took Khudiakova under his wing and subsequently she did the rounds in London’s cultural circles: dining with Francis Bacon, working with Vivienne Westwood and Gilbert and George. Her newly produced Soviet Pop Art paintings were such a hit that Charles Saatchi bought the entire collection, while Elton John was so enamored with her avant-garde fashion designs that he bought many of them for his collection. “People enjoyed her company. She was this exotic player,” Birch recalls. Her sudden death this year came as a shock to those that knew her. Khudiakova had been in the midst of working on a new series of pop art paintings sourced from nostalgic memories of her childhood. 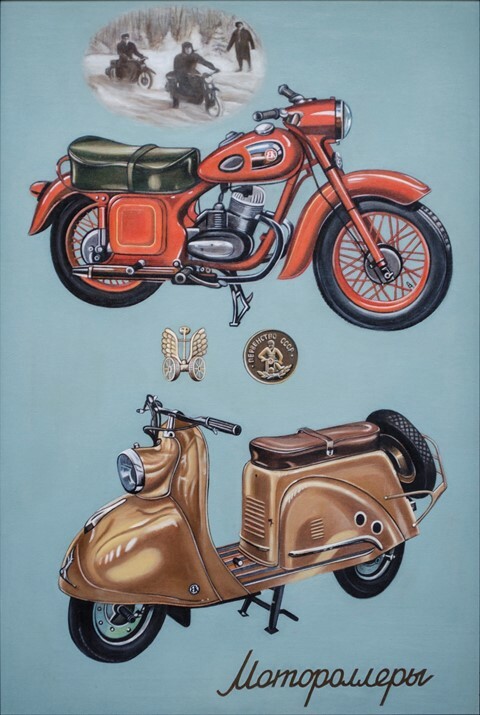 Khudiakova's paintings depict objects familiar to anyone who came of age in the old USSR: dolls in native costumes, a television set broadcasting ballet, mass-produced trinkets of Lenin’s face and of heroic workers holding hammers and sickles. The series was painted entirely from memory, while living on a houseboat on the Thames. It’s clear that while Khudiakova may have made a new life in London, those memories of her Soviet childhood and homeland continued to shape her life’s work.